I had a pretty unique idea for this Daring Cooks challenge right from the get-go, and of course, never found the time to execute it. Had I remembered that a contest was involved this month (see details at the end of this post), maybe I would have been sure to make the time! Instead, in true Melissa fashion, I waited until the last minute and made this quick (and delicious!) breakfast for us…yesterday! Hey, nobody’s perfect. The first time I saw these was over a year ago – my sister made them for us while hosting brunch. I’ve made them a few times since then…they never fail to satisfy and impress. You could change it up a bit by using scrambled eggs, or a different kind of cheese or bread. I used what I had on hand. I’ve also made a low carb version by skipping the bread and using canadian bacon as the cup. Preheat oven to 400 degrees. Prepare a muffin pan by spraying with non-stick butter spray. Cook bacon in a skillet until partially cooked. Place on paper towel lined plate and blot off all excess oil. Use a standard size glass to cut a circle out of each slice of bread. Press each piece into muffin pan. “Line” each tin with bacon around the sides, forming a circle on top of the bread. Fill each tin with a spoonful of cheese. Crack each egg and after discarding about half of the egg white, drop into tin. Repeat with the rest of the eggs. Add salt and pepper and cook for approximately 8-10 minutes (or as long as it takes to cook eggs to your liking). Remove each cup gently with a spoon. Serve immediately. 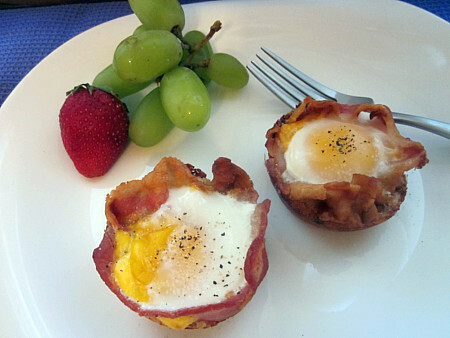 This entry was posted in bacon, breakfast, cheddar, Daring Cooks, eggs, QuickAndEasy. Bookmark the permalink. How wonderful are your recipe<3<3<3 It looks so cute and delicious. Great work. These are always a big hit in my house. Yum! What a perfect weekend breakfast! I always love baked eggs. Adorable! Great idea for an edible container, I’m sorry you weren’t able to include it in the contest 🙁 next time! No matter how many times people have done this already, it’s always a winner! delicious!!! Thanks for participating, you did an amazing job! cant wait to try this 🙂 found you over on melt in your mouth monday! Cutest addition to any brunch! Mmmmm, switch it up w/sourdough or rye!!! There are edible containers, and there are bacon-edible containers. This is a winner. Looks amazing!